If you are around Ravenna/University District today or tomorrow, you can see how a huge mural of the Montlake Bridge is being painted on the side of an old brick building. 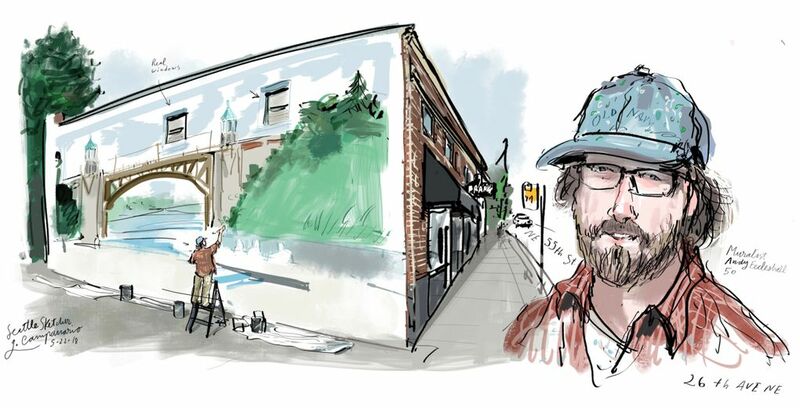 If you are around Ravenna/University District today or tomorrow, you can see how a huge mural of the Montlake Bridge is being painted on the side of an old brick building near Northeast 55th Street and 26th Avenue Northeast. The artist at work is Edmonds muralist Andy Eccleshall, the creator of many other murals in the Seattle area, including the one at Dragers Classic Cars on Aurora Avenue —remember when I sketched that one and the dealership’s owner a while back? Eccleshall said people are already taking notice and stopping by to chat. Someone told him there used to be a Piecora’s New York Pizza painting on this wall — does that sound familiar? But it had disappeared when the wall was painted over years ago. He has been working 12-hour days for a week now and says he will be finished with the scene by Thursday. As I was sketching and talking to him, a driver went by and yelled: “It’s looking fantastic!” I couldn’t agree more.